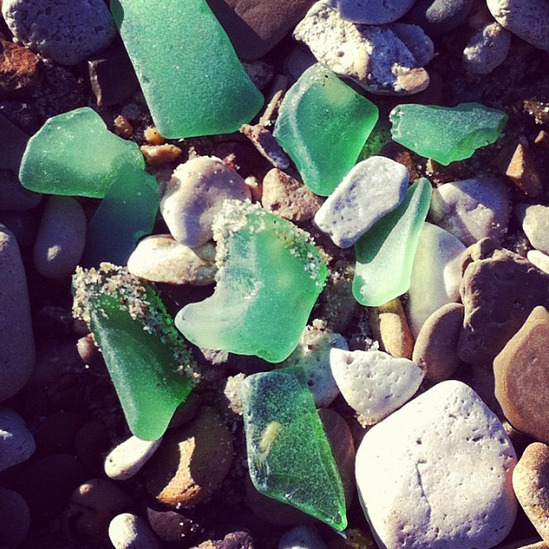 sea glass is found on beaches along oceans or lakes. remnants of everyday items—bottles, jars, plates, windows, windshields, flasks, containers—whisked to sea and transformed by the rolling tides and soothing forces of wind, sand and water. discovering it in the sand is like a revelation. from mundane to sublime. ordinary to extraordinary. simple yet profoundly deeper than expected. "sea glass" is a blog is about finding inspiration in the every day. like the shards of glass or tattered fragments of everyday life, moments can easily be missed, forgotten about, thrown away. our bustling, chaotic existence, with all of its meetings and deadlines and practices and appointments and never-ending to-do lists, can prevent us from truly experiencing the awe-inspiring moments in life. those moments don't just exist in milestones like marriage or childbirth, the purchase of your first home or your baby's first steps. they don't just exist on while on vacation in exotic locales. they don't just occur because hallmark tells you there's an occasion to celebrate. inspiration also exists in places you least expect it. during the drudgery of daily life, with all its messiness and imperfection. an unexpected gesture of kindness. a stunning reflection in a parking lot oil slick. an enduring bond of friendship. little successes that aren't earth-shattering but get you even a centimeter closer to a goal. "sea glass" is about opening yourself up...finding transcendent moments in everyday life.